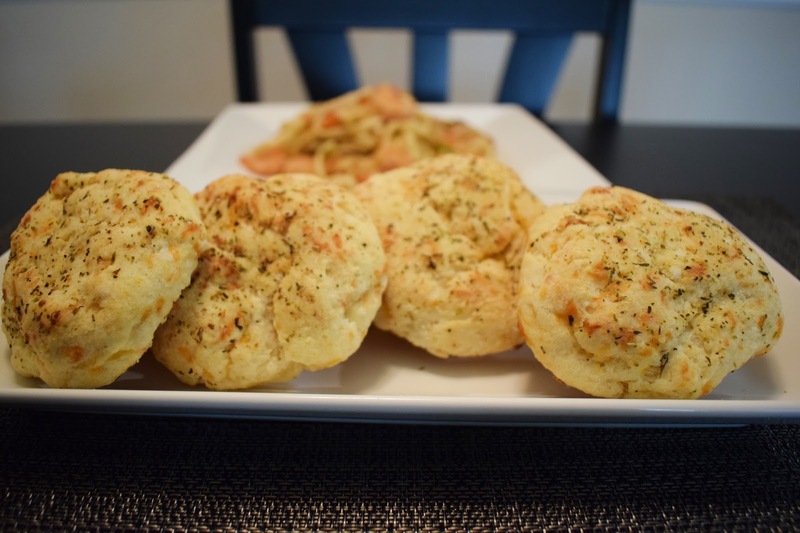 In this video I will show you how to make one of my favorite Biscuits recipe! I hope you can give them a try, they are so easy and delicious! Thanks for watching! I hope you are all doing great! And once again, thank you so much for your support, it really means a lot! May God continue to bless you all! In a small bowl combine 3 tablespoons of butter with one minced garlic clove and a teaspoon of italian seasoning, place this in the microwave for about 30 -40 seconds until the the butter is melted. Then set this aside until you are ready to use it. Now in a large bowl combine the all purpose flour with the salt and baking powder, stir until combined. Then add in 5 tablespoon of cold butter cut into small cubes, and combine with the flour until you get a texture similar to breadcrumbs. Once you get the desired texture, now push the flour mixture to the sides of the bowl, then right in the center of the flour mixture, now add in the heavy cream and the shredded cheddar cheese. Now combine this until all the ingredients are well incorporated, do not over mix. Once You are done. Now you can make the biscuits. Just grab some of the dough and drop it onto a baking sheet, or you can use yours hands to give the biscuits a rounder shape. And now we are going to bake this at 450º f for about 12 -15 minutes or until they are slightly brown and well cooked..
Once they come out of the oven, now brush them again with a bit more of the melted butter mixture and that’s it! Now you can serve them.